ICED EARTH Debut Video For Single, "Black Flag"
Here it comes: US metal masters ICED EARTH have released a jaw-dropping new video for the song "Black Flag" from the current masterpiece, Incorruptible. "Black Flag" is one of the most epic tunes on Incorruptible and a monumental elegy of treason, oppression and the fight for freedom. Watch the music video, directed and produced by iCODE now on KNAC.COM HERE. Get Incorruptible (incl. “Black Flag”, “Great Heathen Army”, “Raven Wing”, “Clear The Way (December 13th, 1862)”, “Seven Headed Whore” as well as five more killer tunes) on CD, LP and digital album HERE. 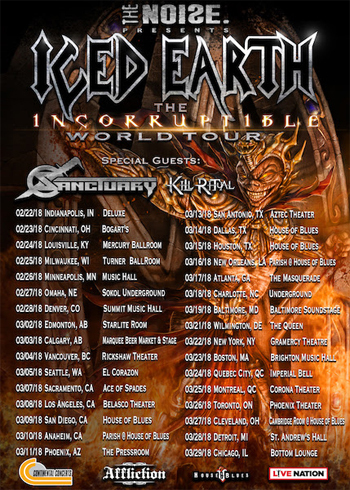 Right now ICED EARTH are preparing for the first part of the World tour for Incorruptible that will kick off on January 9, 2018 across Europe. Shortly after the band will continue to North America for the second part. Prepare for real US metal! A list of all upcoming dates can be found below.